It’s the most ordinary of things that sometimes turn out to be the most extraordinary of circumstances. Angie Szymanski found that out on October 4th, 2003. Angie was a young, 36-year-old kindergarten teacher with a young adult’s typically busy schedule, but her world was about to change dramatically, in the most unexpected place. She was simply going about her business, getting ready for her day by taking a shower, when midway through, she had an ischemic stroke on the left side of her brain. Angie’s family found her incapacitated, and called for help. The responding emergency medical technicians attempted to stabilize her as she was rushed to Ocala Regional Medical Center, in Ocala, Florida. There, they administered TPA (tissue plasminogen activator) to Angie to dissolve the clot that was blocking a main artery. Doctors told Angie’s husband, “Ski”, that she had a 50/50 chance to survive at this point. But, Angie bucked the odds. The clot was resolved, and after spending one week in Ocala Regional, she was transferred to Univ. of Florida Health Shands Hospital, in Gainesville, Florida, to continue her acute care hospitalization for another four days. However, her initial recovery came at a cost. Angie now had expressive aphasia, a paralyzed right arm and a right-sided foot drop. She had to use a wheelchair because her balance was severely impaired, and she was too weak to walk. So, Angie entered UF Health Shands Rehab Hospital in Gainesville to begin six grueling weeks of physical, occupational, speech and balance therapies to recover what physical capacities that she could. 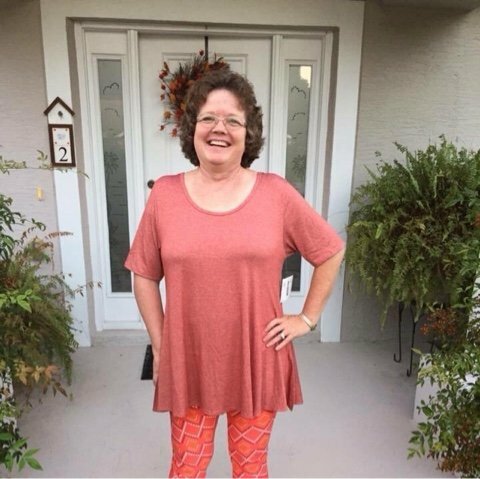 When she left Shands Rehab as an in-patient, Angie continued out-patient therapy there, and at another facility, Town and Country Physical Therapy, in Ocala, Florida, for an additional one and one half years. She also attended Geril Therapy (a rehab facility) in Ocala, for training and therapy using the Bioness® Saebo device. When she was ready, Angie returned to Shands Rehab Hospital for two weeks of drivers training, to regain her driving privileges, and to learn how to drive a modified van with a steering wheel knob and special foot pedal. All in all, it took her nearly two years to recover to where she is today. Angie says that in the first few months post-stroke, she experienced depression, and was psychologically crushed at having to give up both her teaching position (identity / purpose) and her driver’s license (mobility / freedom). She felt somewhat helpless that her whole life had changed, literally, overnight. But, Angie has a deep, abiding faith in God, who sustained her throughout her darkest post-stroke times and continues to give her comfort and strength every day, particularly when she feels down or overwhelmed. Angie also says that her husband, “Ski”, is her “rock”; he has stuck with her throughout all the stroke turmoil and its aftermath. As a result of her stroke, Angie had to retire from teaching kindergarten, so she concentrated on raising her two children (both of whom are now grown up): Alyssa, who is now married, and Josiah, a former Marine, who is now a student at University of South Florida, in Tampa. In fact, Angie feels that her greatest post-stroke achievement has been to see her kids grow up and become capable young adults, which has brought her much joy. There are other post-stroke accomplishments that Angie values: regaining her driving rights, and being able to drive a modified van; being able to pack away her wheelchair (although she still walks with a limp); and being able to talk, despite still having aphasia. Angie used to have more networking opportunities when she belonged to a stroke survivor’s group in Ocala, however, the group disbanded. She still “networks” informally with former group members whenever she sees them around town. And, she likes to educate people about stroke whenever she can, such as when she travels or even when she’s just out and about. She tries to put these new contacts on her Facebook page, so that she can keep them up to date. In an unusual twist of fate, a few months back, Angie found herself helping out with another stroke survivor, her 59-year-old uncle, who had a stroke event near the end of 2016. She helped drive her parents where they needed to be, as her uncle recovered in the hospital, and was subsequently discharged to her parent’s care. Her uncle’s circumstances gave her new insight into what her immediate family experienced when she had her own stroke. Nowadays, Angie enjoys traveling with her husband, and is looking forward to becoming a grandmother in the future. She continues to manage her stroke residuals by doing special shoulder subluxation exercises, and exercises to offset her right-arm spasticity. Don't give up hope; keep plugging away! Try to surround yourself with good friends or support people. Believe that God let you survive to give hope to other people. Volunteer for something that you are good at; focus less on yourself.